The A series slow speed granulators feature a staggered rotor directly-driven by a geared motor. The low rotor speed reduces the noise level of the machine and creates less dust while grinding. The special design knives of the A series can be sharpened easily and do not need adjustment afterwards. The material is fed via a sound absorbing feed hopper that can be tailored to fit various applications and feeding ways. Depending on the requirements the machines can be fitted with a wide variety of hoppers, they are mounted on either low or high level base frames with matching suction bins or bag filling adapters. Quick snap fasteners and hand screws make access to the machine for cleaning and maintenance fast and easy. The A 18 series is best suited for thin walled pieces. The A 30 can be used as low noise central granulators for small throughput requirements as well. Their stronger design allows them to be used for stronger and thicker materials while offering the same advantages regarding low noise and dust as the smaller A machines. The resulting granules are then immediately reintroduced into the production process. The machines can be used for rejected products in the inline recycling process as well. Different hopper and base frame designs make it possible to integrate the machine with most types of operations. All A models can be equipped with a built in blower system in case a vacuum loading system is not available, or to transport the ground material to bags for storage. The curvature of the specially profiled rotor knives ensures a constant cutting radius after re-sharpening thus maintaining the original cutting gap. Awkward knife adjustment is no longer necessary. Staggered rotor blades create an individual blade cut thus increasing the cutting torque. 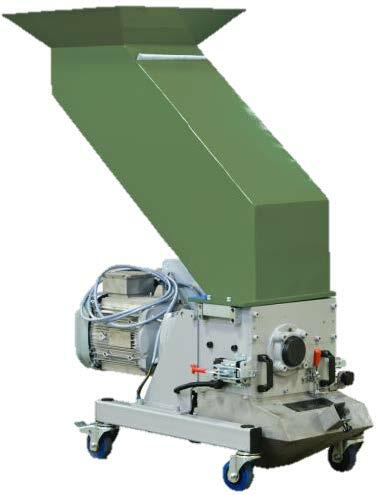 All of the machines in this series are therefore suitable for grinding more solid materials and thicker walled sprues. The quick snap system makes access to the cutting chamber, suction trough and screen area fast and easy. The hinged screen holder simplifies screen installation.